Lancaster Lodge was the second of the Lodges in the Group of Lodges in Portugal to be consecrated. The fourteen Founders were of six different nationalities, all of whom had practised their Masonry under the English Constitution, bar one, who had been initiated in the USA whilst at University there. They had been members of Lodges in Africa, Malaysia and America as well as England so the Lodge started with a strong feeling of International Brotherhood, which continues to this day. Currently, with a membership of 33, the Lodge was consecrated in 1991 by R.W. Bro. Menase James Massias, District Grand Master of Gibraltar and is now meeting at the Hotel Clube do Lago in Estoril. Serving not only the needs of Masons in the local area, the last few years have been particularly fruitful in raising funds for various deserving causes. 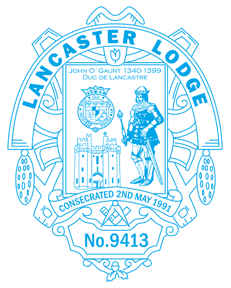 Indeed, Lancaster Lodge is proud to be a Grand Patron of the Grand Charity, Grand Patron of the Masonic Trust for Girls and Boys, and Grand Patron of the Masonic Samaritan Fund. Quite a feat for such a small lodge, that goes to show it has a large heart. Ladies Night see: The General Articles section – Social Events. Third Monday in January, March, May, September, October and November. The next meeting: Monday 18th March. Held at Hotel Clube do Lago, Av. do Lago, 4, Estoril, at 4.00pm prior to the monthly meetings in January (Installation), March, May, September, October, November.